Hello Beauties! I hope you're all well and had a lovely weekend. Today was my first day back at work after a lovely week and a half off so needless to say, it was a busy one and I'm now in need of a well deserved rest! I haven't quite had time to put together my Sephora haul yet since I've returned from the states (it's been a busy few days!) but I wanted to start reviewing some of the products I'd had the chance to test out properly as I've completely fallen in love with a few of the products! The 'Tartelette in Bloom' was one of the first products I broke into as soon as I got back to my apartment in Vegas, so it seemed fitting to feature this palette first on my blog. 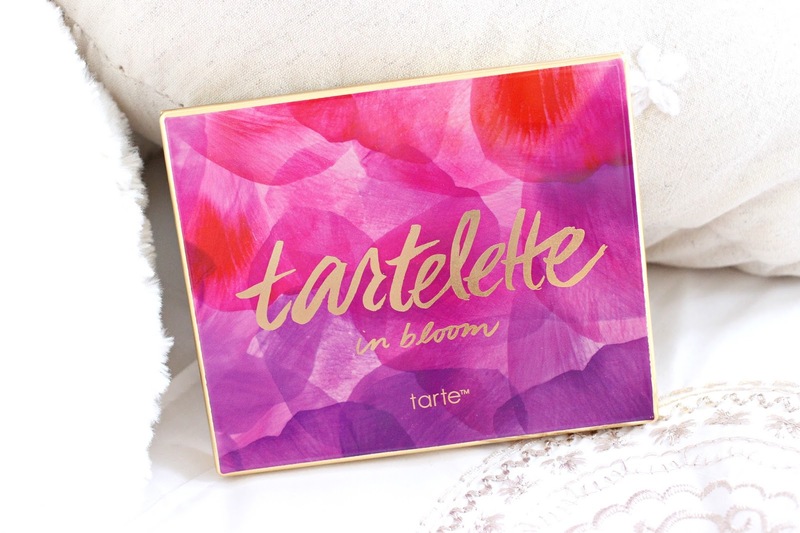 The Tartelette in Bloom Amazonian Clay Eyeshadow Palette was released as part of their Spring collection, and is a new take on the ever popular Tartelette palette, which was released sometime back last year. The original Tartelette palette features an array of matte pinks, creams and purples, whereas the Tartelette in Bloom leans more towards the neutral side, with warmer, richer shades of creams, browns and taupes in both matte and metallic finishes. As you can probably tell, I'm completely in love with this palette. It has everything I'd want from a neutral palette and the formula of the shadows is up there with some of my favourites such as Too Faced and Urban Decay. It's also worth mentioning that Tarte products are all cruelty free and vegan friendly, along with containing no paragons, gluten, phthalates and mineral oil - what more could you ask for? If you're a UK gal like myself and haven't got any trips to the states planned, then you're in luck - Tarte now ships to the UK from their website here and are also available in QVC! gorgeous shades! they look so creamy and pigmented! this palette looks gorgeous! i'm in desperate need of a neutrals palette and i think this is the one! This is such a beautiful looking palette. I especially like the first and third set of swatches. I love the packaging of Tarte's Spring collection - so pretty! The highlighting palette looks especially gorgeous. I've been lusting after this for a while now, I love it when a palette has the perfect mix between transition/matte shades and the shimmery colours :) The packaging is pretty as well! i love this palette!!! i have been wanting to buy it bc it seems perfect for spring! I love this palette! I don't actually own it, but I do play with it on clients at work and that counts, right?! SO buttery and beautiful - I CAN'T. Isn't Vegas awesome?! I've only been once but I could live there! This is so pretty and I've been lusting for this palette as soon as I saw it. Hope you had a great trip and can't wait for the haul. This is such a gorgeous palette, I'm in LOVE!